We first encountered @Skyechefmonty’s innovative cooking when Calum Montgomery served up our best meal of 2016 at Ullinish Lodge on Skye. 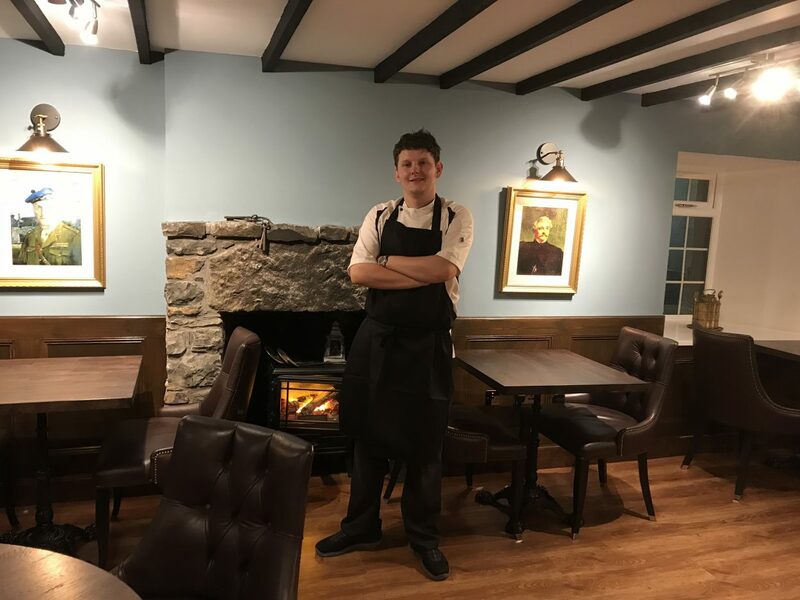 It was only a matter of time before this ambitious and passionate young chef created his own restaurant to showcase his talents and the best of Skye’s larder. Calum’s dream has been realised with the complete renovation of the historic Edinbane Lodge, parts of which date back to 1543. The Montgomery family have spent the last nine months restoring the building into a restaurant with rooms. The Lodge will have four letting bedrooms and two suites once renovations are fully complete. An all-day service of breakfast, lunch, afternoon tea, as well as dinner, are also planned. Luckily, our visit to Skye was perfectly timed and coincided with the restaurant’s first week of opening. Dinner can be booked at either 6.30 pm or 8 pm so we went along for the later sitting on Saturday night to enjoy Calum’s ten-course tasting menu. 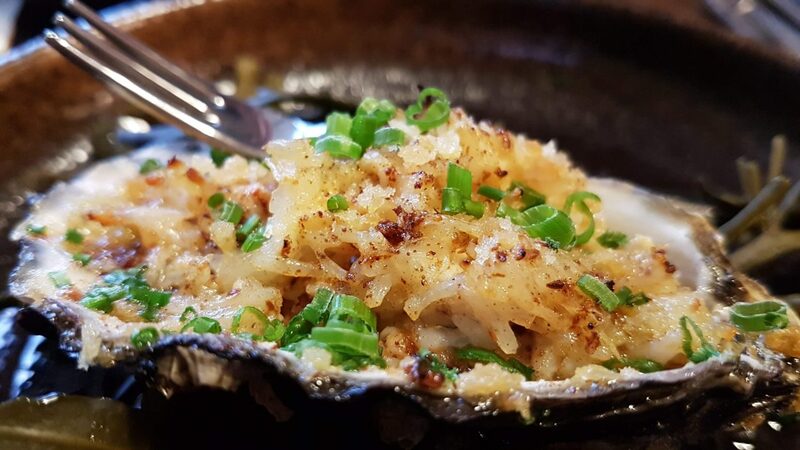 Dishes will change weekly to take advantage of seasonal ingredients and the produce that’s available from the fishermen’s boat and forager’s basket. We followed the journey of the highs and lows of the restoration project on social media and we were looking forward to seeing the finished results. Arriving early we enjoyed a drink in the new bar area. A highlight of this cosy room is the dramatic etched Skye landscapes dotted around the walls. These are part of a large collection of original prints and etching plates the family received from the late, Skye artist Tom MacKenzie. 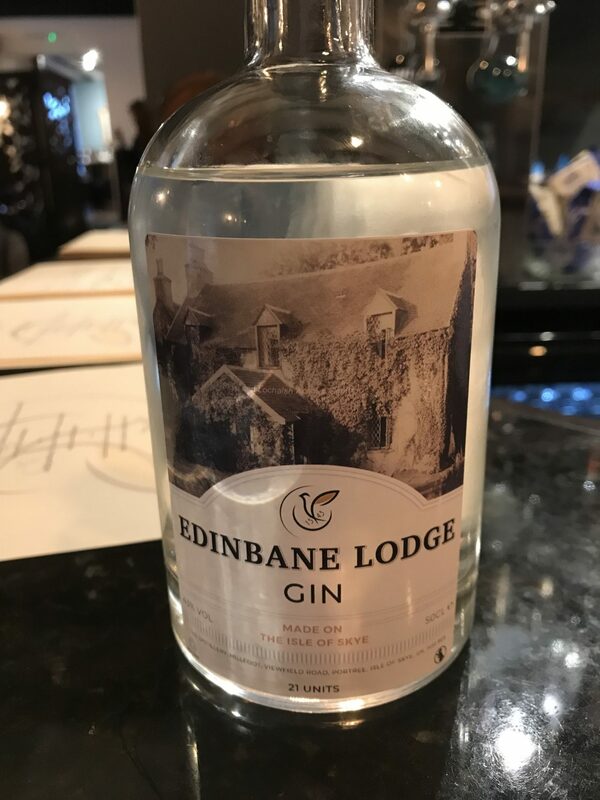 Calum and his wife Eilidh along with Isle of Skye Distillers have created a very special Edinbane Lodge Gin including botanicals foraged from the Lodge gardens. The dry, herbal gin is served with blueberries collected each day by KP, Jamie, just 200 meters from the lodge itself. The perfect aperitif is fittingly served in the very first place legally allowed to dispense alcohol in Skye! Raymond has a mollusc allergy so we loved the fact that he was given his very own personalised tasting menu. 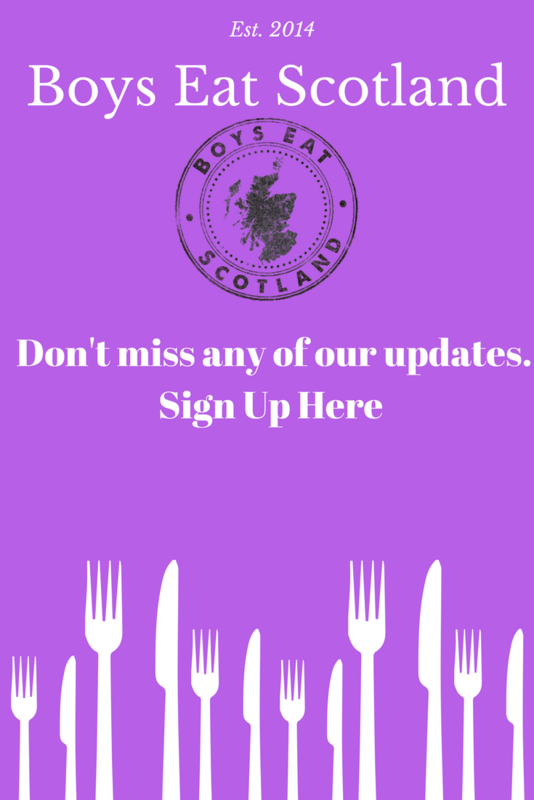 We were asked about any allergies when we booked, so just let them know in advance of any dietary requirements. As we relaxed with our gin and perused our menus Eilidh brought out some canapés for us to nibble on. We enjoyed glazed pork belly, slow cooked lamb shoulder with onion chutney, and salt n chilli squid with saffron aioli. Raymond had mustard tapioca cracker with hot smoked salmon instead of the squid. 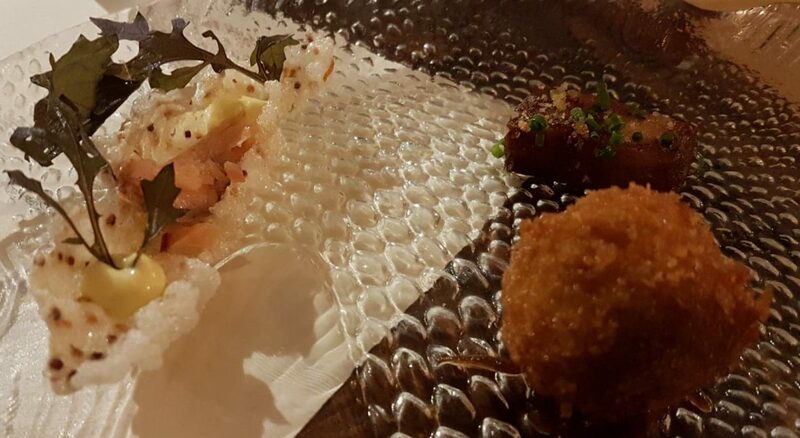 They were a delicious trailer for the main event – each one with its own distinctive texture and flavour. As well as tasting good they also looked visually striking served on a glass, fish-shaped plate. 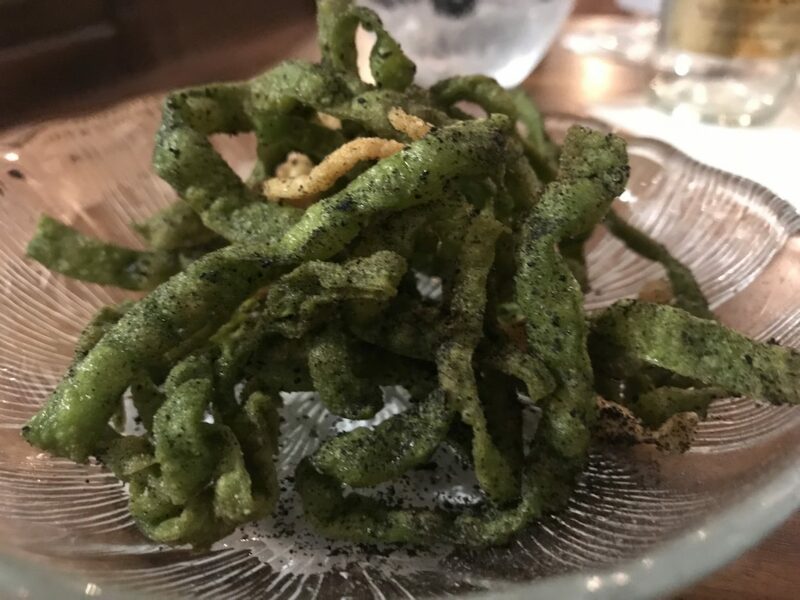 The seashore theme continued with a surprise additional crispy mushroom pasta canapé that looked like a dish of tangled seaweed. It was unusual and deliciously moreish! After our pre-dinner nibbles, Eilidh showed us to our table in the main restaurant. The chatter of locals filled the room as they experienced the new Edinbane Lodge’s taste of Skye for the first time. The dining room is a warm space, featuring a stone fireplace, wooden beams and comfortable leather chairs. Paintings of characters from the Lodge’s past look down approvingly from the walls. 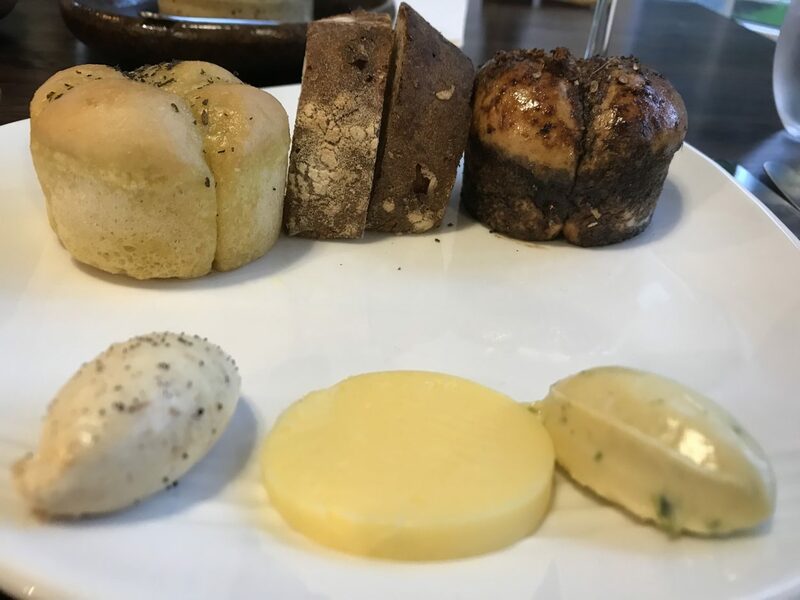 A selection of homemade bread arrived at the table. Balsamic, lemon and coriander, Culisse rapeseed oil and Skye sea salt focaccia and a tasty sourdough. These were accompanied by whipped smoked garlic butter, whipped rosemary butter and salted Orkney butter. If they were meant to be enjoyed with our next course too bad! They were gone in an instant. The balsamic mini-loaf was a particularly sweet and addictive highlight. My next course was charbroiled Loch Harport Oyster, Neist Point Crab and Orkney smoked garlic butter. 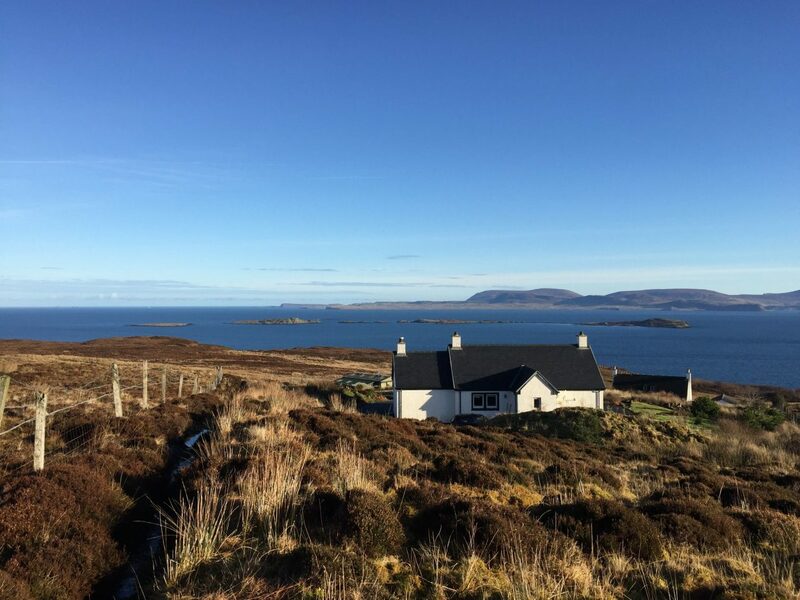 We had a glimpse into the realities of Skye restaurant supply chain logistics earlier in the day when we watched Calum on Instagram collecting the crabs at Neist Point. Knowing this provenance and the respect that the chef has for their ingredients makes the meal even more special. 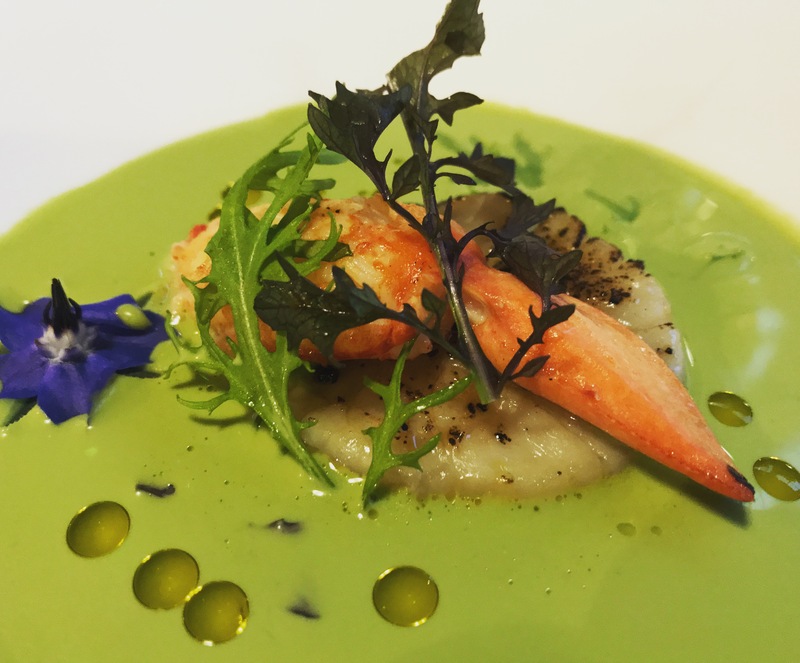 This is one stunning dish – outstanding! Raymond’s menu avoided the oyster but he was equally pleased with his Roasted Onion Velouté. 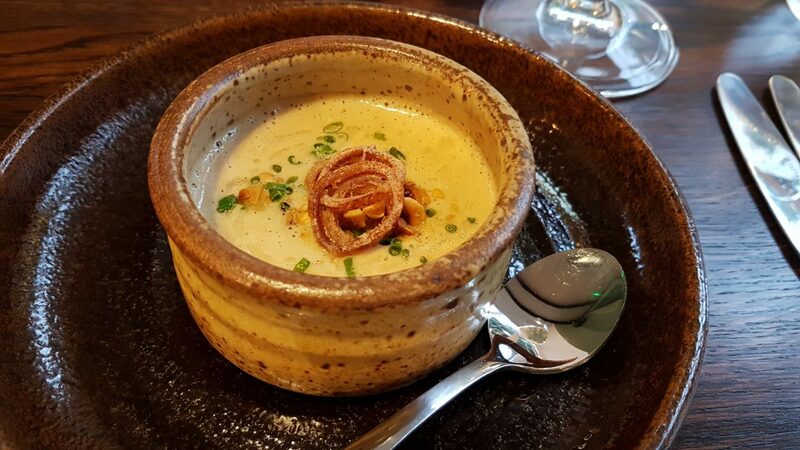 A rich plateful of light and frothy onion soup topped with chives and crispy onion rings. Oh, how he wished he had kept some of his tasty bread or said yes to the offer of more! 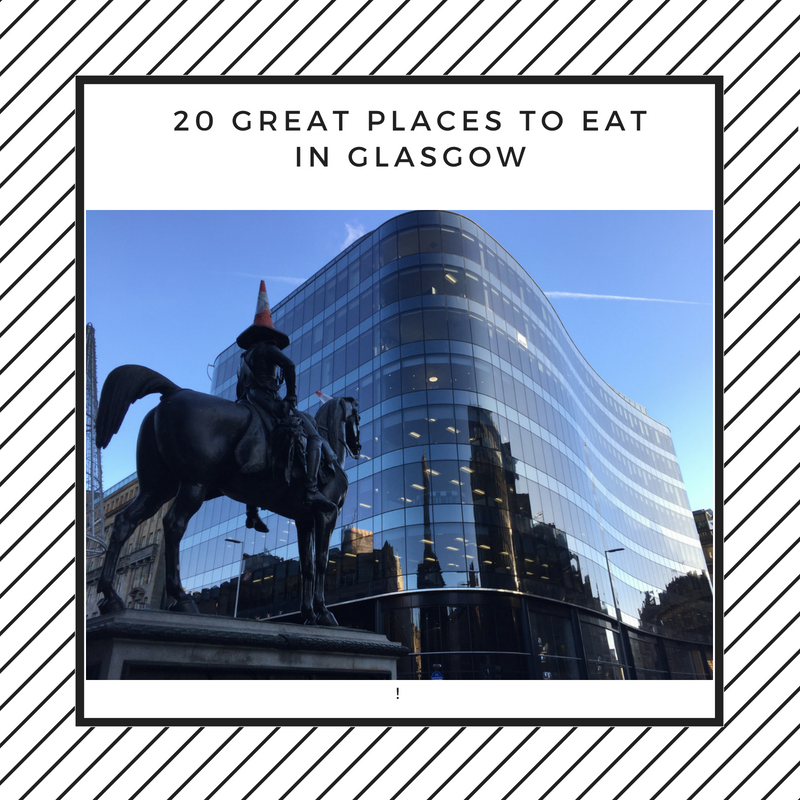 Our menus diverged again as I enjoyed a meaty hand dived Glendale scallop topped with lobster and surrounded with an Orbost Herb and Lettuce Gazpacho. While Raymond enjoyed Skye Free Range Chicken from Vatten, confit leg and tarragon. A rich, earthy autumnal dish that hit the spot. Next up for us both, was Kinlochbervie Hake, charred pear, organic carrots and orange butter. 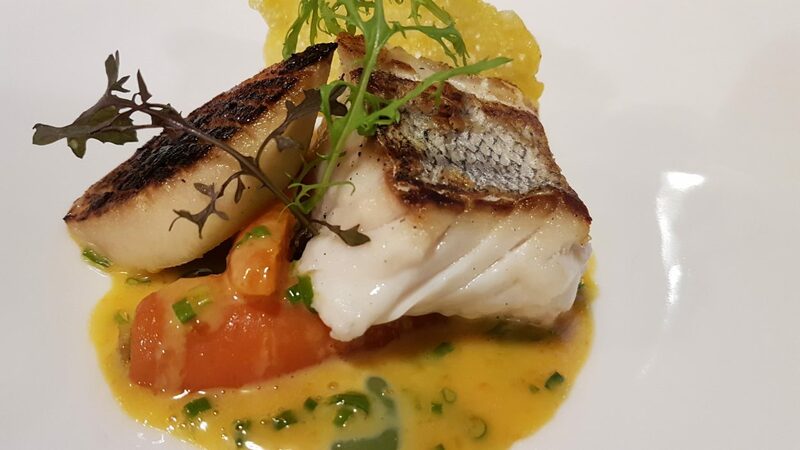 The zesty orange and sweet pear worked tremendously well with the meatiness of the hake. The fish was cooked to perfection and this was a surprisingly light and refreshing course. Our next course must have had the lowest food miles ever. 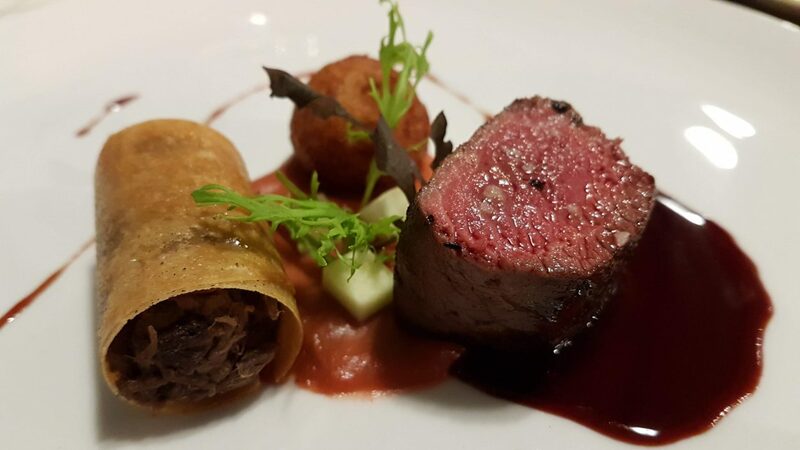 Edinbane Venison served with garden rhubarb and rosemary purée, slow braised shin and a crisp ball – pomme dauphine. The loin was cooked pink, perfectly seared and caramelised on the outside and presented on the tart rhubarb and rosemary purée and venison juices. The “spring roll” of shredded slow cooked shin was an amazing melt in the mouth treat. This was an attractive dish, packed with flavour – another of many highlights! 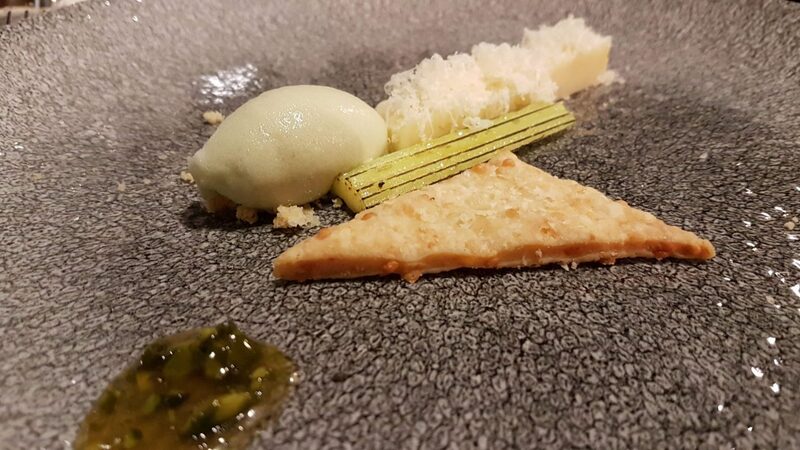 Our cheese course was next presenting a modern take on the traditional plate of cheese and biscuits. A chunk of tangy Isle of Mull Cheddar was served alongside a chargrilled sliver of celery and a cheese sablé biscuit. The accompanying celery sorbet defied all expectations and was delicious but the show was stolen by the amazing truffled honey and pistachios. At Edinbane Lodge you get cheese, pre-dessert and dessert! That’s our kind of place! 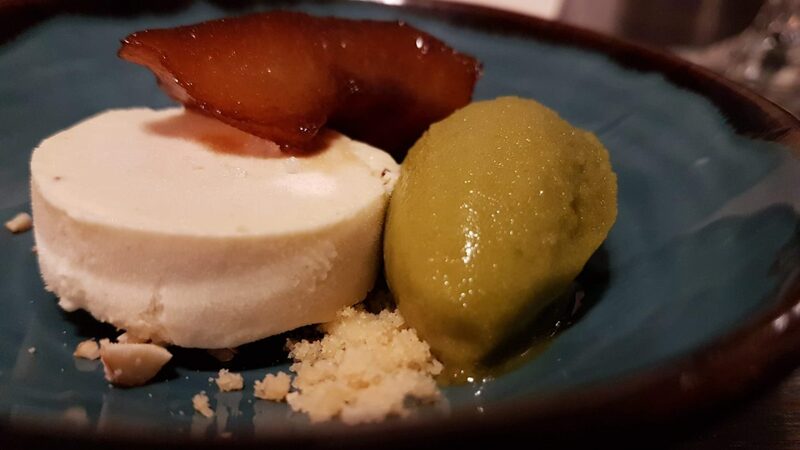 We absolutely loved this and first up was Isle of Skye sea salt caramel parfait with braised pear and sorrel sorbet. We have never really tasted sorrel on its own and along with our fellow diners were enthusing about its apple-like flavour. Word got back to Calum and he was soon out in the garden, head torch on foraging for some sorrel leaves to show us! 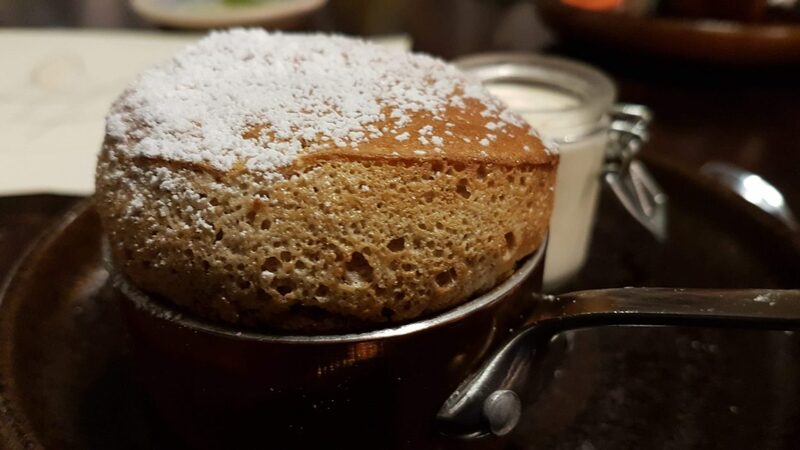 Our final dessert of Talisker and chestnut soufflé with smoked milk ice cream was a dram-atic end to our meal. Breaking through the crisp outer layer releases a blast of whisky vapours; the iodine and smoky flavour of the Talisker are unmistakable. This along with the smokiness of the ice cream left me in Blackhouse heaven with a peat fire smouldering away in the corner. It did divide opinion around the room though and quickly wheedled out the non-whisky drinkers! I loved it. We were too full for coffee but Eilidh brought us some petit fours to finish. Freshly baked madeleines and praline chocolates accompanied our gun cartridge bill. 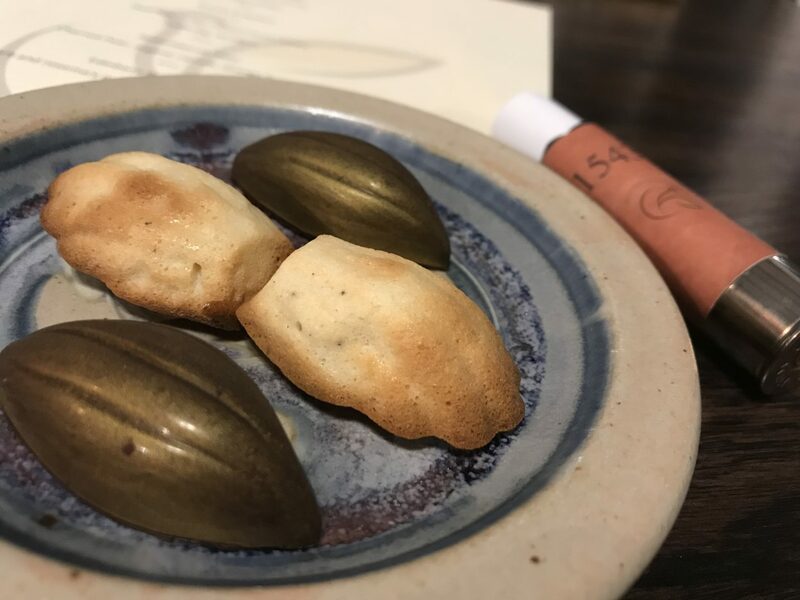 Our chocolates were served on some stunning Edinbane Pottery which featured throughout the meal and is available in the pottery door. 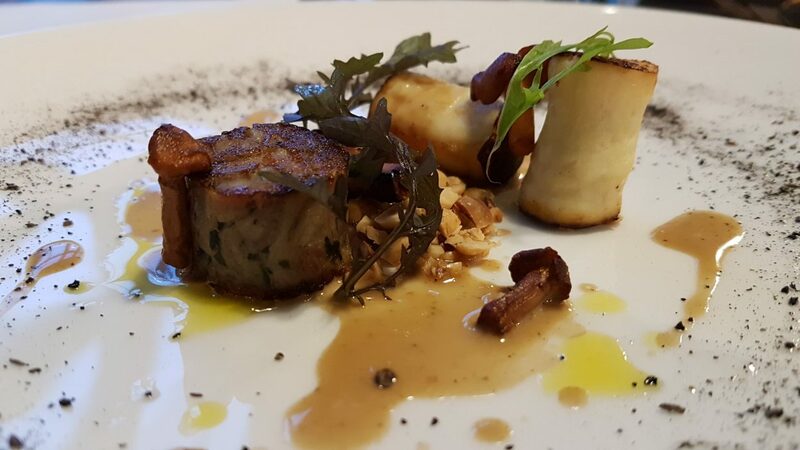 Our 10-course tasting menu costs £65 per person which we think is tremendously good value for the quality of ingredients and exceptionally high standard of cooking and service. From start to finish, our evening at Edinbane Lodge was accompanied by warm, friendly and relaxed service. In such a short time (we visited on their 5th service) Calum and Eilidh have assembled a great team of passionate and knowledgeable staff who go out of their way to make sure you have an evening to remember. 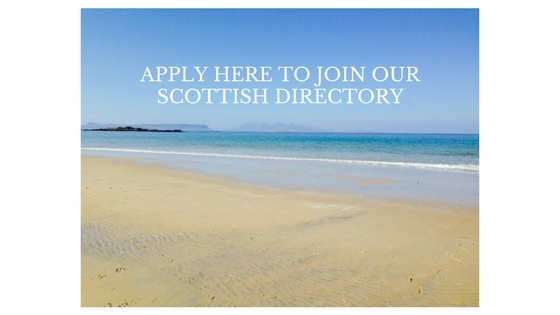 John Grant, a Skye-man making a welcome return to the island after working in The Wolseley in London has also just taken up his role as the restaurant manager at Edinbane Lodge. We highly recommend a visit to Edinbane Lodge on your next trip to Skye. 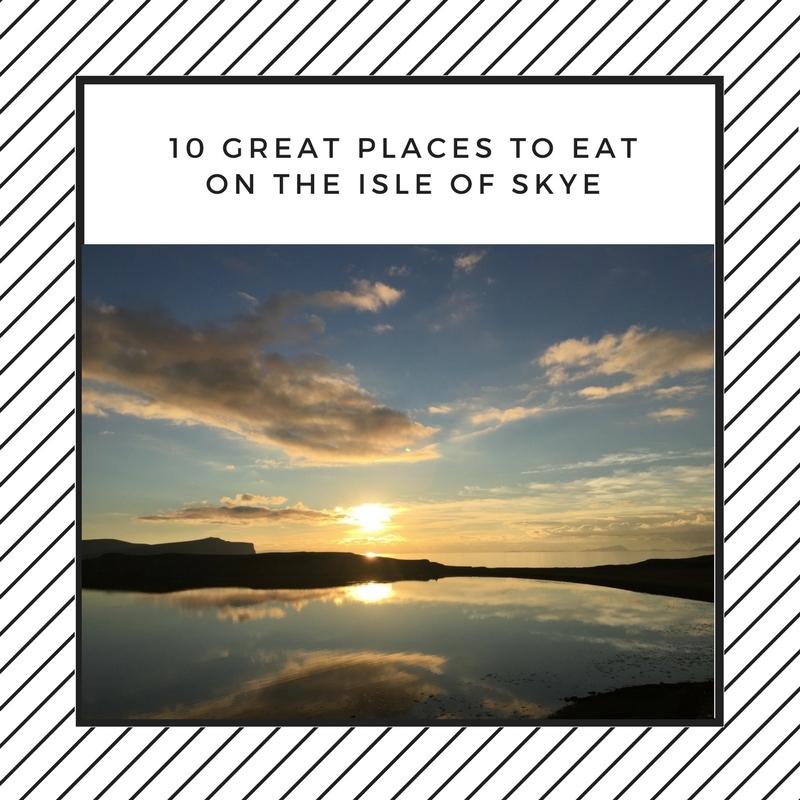 This restaurant is a fantastic addition to Skye’s thriving world-class food scene.